Zach Espinosa. Photo by Cari Taylor-Carlson. I arrive at ABV Social on Burleigh just east of the Zoo Freeway, part of the Mayfair Collection, on a Tuesday to interview Executive Chef Zach Espinosa. There’s energy and bustle happening around me as I wait to meet the chef. Someone mops the already immaculate floor, suggesting attention to detail is paid here. That’s one of the many strengths of Chef Espinosa, who oversees the kitchens of three Bartolotta restaurants in this complex, ABV Social, Taqueria El Jefe, and Café Grace. Undaunted by this complex operation Espinosa says, “I’m used to wearing many hats. If a chef doesn’t show up, no problem, I take over. Today I’m in charge right here.” Espinosa says he needs to know the night before where he will be working in the morning so he can prepare, given how complicated the job is. Then if a crisis strikes, he’s ready to take over. He oversees three different restaurants with three totally different menus: ABV Social, mainly a sports bar, offers high end bar food; El Jefe, a classic taqueria, serves mainly tacos, some traditional and some not; Café Grace, a white tablecloth restaurant and the most upscale of the three, serves classic French cuisine. Espinosa has high expectations for the growth potential of the three, especially Café Grace with its French cuisine, which is hard to find this far west in the metro area. He says, “We’re babies with these brand new restaurants. Like babies, we’re just now getting the crawl down.” That means twelve-hour work days for Espinosa whose enthusiasm carries into the kitchen where he thrives on interactions with his staff, all 120 of them on weekends. He believes it’s important for his staff to succeed and encourages them to do their best work. He grew up on the border between West Milwaukee and Wauwatosa, attended Wauwatosa West High School, played sports, and in his junior year, at age fifteen, went to work at One Potato Two Potato in the Mayfair Mall. In his senior year he took a second job at a radio station, 102.1 which led to his decision to major in mass communications at UW-Milwaukee. While he was a freshman at the university, he worked his way up to manager at One Potato. He rode the bus an hour-and-a-half each way to get to and from work. “I didn’t want to let them down,” he says. Around this same time his dad reminded him: “Do what makes you happy.” Espinoza decided mass comm wasn’t his passion and changed his major to criminal justice. “I thought I’d like to be a forensic scientist.” He left the job at One Potato and took a job closer to UWM at the former Columbia Hospital. Again, he was in a kitchen, this time doing prep for the chef and delivering trays to patients. That was when he realized that interacting with people, whether working with the staff or chatting with the patients, gave him the most joy and enthusiasm. “My brother has no idea that this chance comment changed my life,” Espinoza says. He returned to his dad’s advice, choose what makes you happy, and after some soul searching recognizes the obvious: working in a kitchen with people was where he belonged. He enrolled at MATC in the Culinary Arts Program and graduated second in his class. He took his degree to Rock Bottom Brewery where he got his foot in the door as a professional in his now chosen field. Something clicked at Rock Bottom. “I just knew this was for me, the chaos, the insanity, the misfits, the camaraderie.” While he was filling out the employee paperwork, a kitchen worker pulls a knife on another employee. He started his work at Rock Bottom in the pizza pit and five years later he was Executive Sous Chef. He left Rock Bottom to take a job at Pizzeria Piccola, his first job with the Bartolotta Restaurants. After six months he was managing two Piccolas and the main commissary. Since that first job, his resume reads like a list of the Bartolotta Restaurants. From Piccola he moved to Bacchus and says, “That’s when something else clicked for me. That’s when I knew I was a real professional in the business.” At Bacchus he worked primarily with sauces and soup and helped the chef prep the specials. After two years at Bacchus, he moved to Lake Park Bistro as Executive Sous Chef. 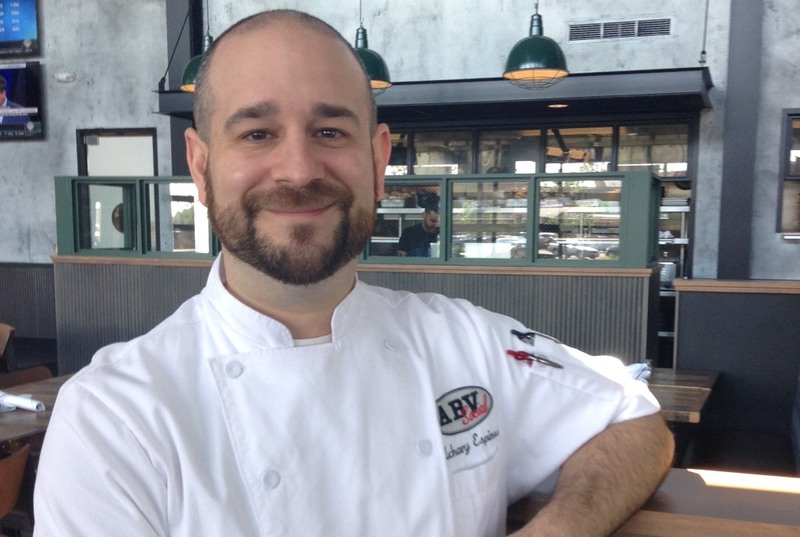 From there he moved to the catering kitchen at Discovery World, and in 2011, was promoted to Executive Chef at the Harbor House. When I ask about his favorite kitchen utensil I get a surprise answer. “A plating spoon because it’s not for fancy food. It has multiple purposes. I am like that spoon.” He’s right. Just like the chef, the spoon is versatile; it does more that its original job description; it’s a workhorse, yet it’s the ideal tool to complete the many tiny details that make a kitchen run smoothly. It can also add the final touch to make a meal special. Master Chef? Fake chef seems more fitting. Does ordering 90% of your menu through Sysco sound like someone trying to creatively bring the best food experience to his guests? I ate at ABV and it was awful. Be careful about throwing around the term “Master Chef” at last count there were less than 100 Certified Master Chefs in the United States. Poor choice of words.